Proteins are polymers of .amino acids. The name of proteins is derived from the Greek word called prokios. It means first place. Proteins always contain atoms of carbon, hydrogen, nitrogen. oxygen, and sometimes sulfur. Proteins are composed of more than 50% of the dry weight of most cells. Amino acids are the building blocks of proteins. Amino acids contain an amino group (NH2), a carboxyl group (COOK a hydrogen atom, and a functionaLgroup R. They all are bonded to a central carbon atom called a carbon. The a carbon is an asymmetric carbon. It is attached with four different covalent partners. (a) Hydrophobic amino acids: These amino acids contain non-polar side chain. chains. There are ttso types of hydrophobic amino acids. Acidic amino acids: Their side chain is generally negathe in charge. Basic amino acids: their side chains are generally positive in charge. Twenty different amino acids commonly occur in an ima Is. Peptide bonds join amino acids in chains. Peptide bonds are covalent bonds. The carboxyl group of one amino acid bonds to the amino group of another amino acid in peptide bond. One molecule of water is released. The chain of amino acids can vary from fewer than 50 to more than 2.000 amino acids in different proteins. A protein consists of one or more polypeptide chains. These chains are twisted, wound and folded upon themselves to form macromolecule. This macromolecule has definite three dimensional shapes called conformation. The function of protein depends upon its conformation. Form example enzyme can perform its function by key and lock mechanism. This mechanism is possible only due to conformation of protein of an enzyme. Many proteins are globular. Some are fibrous. Each type of protein contains a specific number and kind of amino acids. These amino acids are arranged in a particular sequence. The protein molecule may be coiled and folded. They may interact with other protein molecules and form a unique three dimensional structure. Different kinds of protein molecules have different shapes. Their shapes are related to their particular functions in life processes. A protein molecule has several different levels of structure. The linear sequence of amino acids in the polypeptide chains is called primary structure. For example lysozyme is an antibacterial enzyme. It is present in tears, saliva and other body secretions. Lysozyme is a small protein. It is only composed of 129 amino acids. The primary structure is like order of letters of very long word. The sequence of amino acids in protein is specific. Slight change in primary structure can affect protein conlbrmation and ability to function. Its example is sickle cell anemia. In this case, only one amino acid is not in its proper position. It is unable to perform its function normally. First primary structure was determined by Frederick Sanger. He determined the sequence of insulin hormone. hydrogen bonding between every fourth peptide bond is called alpha helix. It was First described by Linus Pauline, and Robert Corey in 1951. Alpha helix is formed in enzyme lysozyme and a keratin. (b) Pleated sheet: A sheet of polypeptide chain formed by the folding back and forth of the polypeptide chain is called p pleated sheet. In this case. two regions of the chain lie parallel to each other. Hydrogen bonds between the two regions hold the structure together. The ri sheet ffirms dense core of many globular proteins. 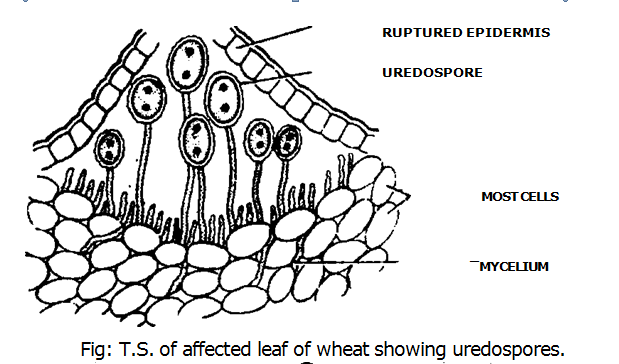 Most of the fibrous proteins have D pleated sheet in their secondary structure. 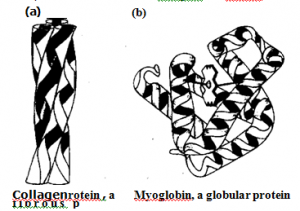 The examples of fibrous proteins are silk and fibroin. 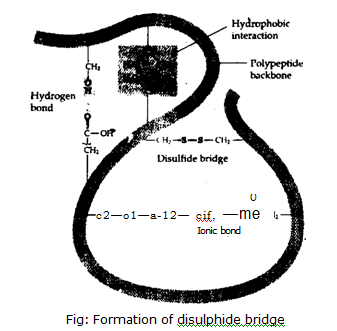 (a) Hydrophobic interactions: The mest important bonding occurs due to hydrophobic interactions. Hydrophobic interactions are caused by behavior of water molecules. The amino acids of polypeptide with hydrophobic side chains collected at the core of protein. They are now out of contact w ith the water. These side chains form clusters and weak hydrogen bonds arc formed between them. The groups of such large number of hydrogen bonds keep the structure intact. sulthydryl groups on their side chains are called cysteine amino acids. The sulfur of one cysteine bonds to the sulfur of second cysteine and disulphide bridge is formed. The structure formed by the aggregation of two or more polypeptide chains is called quaternary structure. The aggregation of such polypeptide chain forms one functional macromolecule. Each polypeptide chain is called subunit of protein. These subunits give rives to quaternary structure. The example of tertiary structure is collagen and hemoglobin. (a)Collagen: Collagen is a fibrous protein. It has helical subunits. These subunits supercoil into a large triple helix. It forms a rope like structure. It gives the fiber great strength. (b)Hemoglobin: The quaternay structure of hemoglobin is composed of four subunits. The subunits are composed of two kinds of polypeptide chains: .I’wo u chains and two 13 chains. 2. Messengers. by transmitting messages to regulate biological processes. This function is done by hormones. i.e. insulin etc. 1. Transporters of other molecules throughout membranes. Among the most known globular proteins is hemoglobin. It belongs to member of the glob in protein family. Immunoglobulins (IgA. Ign, luk. IgG and IgM), and alpha. beta and gamma globulins. filamentous protein molecules that form one of the two main classes of tertiary structure protein. Fibrous proteins are only found in animals. Fibrous proteins form rod or wire like shapes. These are usually structural or storage proteins. They are water-insoluble. These are found as an aggregate due to hydrophobic R-groups. The amino acid sequences are riot repeated in them. •these can form unusual secondary structures, e.g. collagen triple helix. The structures often contain cross-links between chains, for example disulfide bonds between keratin chains. Fibrous proteins are used to construct connective tissues, tendons, hone matrix and muscle fiber. Examples of fibrous proteins include keratins. collagens and elastins. 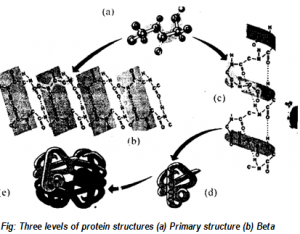 Proteins as structural material: Proteins are structural material for the animals and plants. Proteins form the major part of the dry weight of animals and plants. Proteins are major part of the all the membranous system of cell. Energy source: Although proteins does not acts as fuel for body but still proteins provide energy to body. Protein is broken down into amino acids during digestion. Then deamination of these amino acids takes place. Ammonia is released and different compounds are formed. These compounds enter into respiratory pathways (Glycolysis and Krebs cycle) at different points. 4. Defense of body: Proteins are used against disease in higher animals. Antibodies and interferon are proteins in nature. They defend the body from the attack of bacteria and viruses. S. Proteins as chemical messengers: Proteins act as chemical messengers (hormones). Some of the hormones like insulin and glucagons are protein in nature. Receptors on cells membrane: Proteins combine with glucose to form glycoprotein. ‘Riese glycoproteins are attached on the cell membrane. They act as receptors on cell membranes. Enzymes Some proteins act as enzymes. Enzymes play important roles in metabolic reactions. They enter and speed up specific chemical reactions. Reserve food: Most part of the fruits and vegetable is composed of proteins. Thus proteins act as storage compounds. Albumin is stored in egg white. It is major source of amino acids for developing embryo. Casein is present in milk. It is source of amino acids for baby mammals. Structural fibers: Most of the structural fibers of plants and animals are protein in nature. Contractility: Most proteins are involved in contractility. For example dynein in cilia and flagella, tublin in spindle fibers, actin and myosin in inuscles.